Saint Nicholas was the Bishop of Myra in Lycia (present day Turkey). He is known not only for many miracles but also for his love and compassion for both the poor and children. He was present at the First Ecumenical Council in Nicaea (c. AD 325) as a staunch opponent of Arianism. This historical character was the inspiration for a mythical figure known as Nikolaus in Germany and Sinterklaas in the Netherlands and Flanders, which in turn was the inspiration for the western “Santa Claus.” Sinterklaas (a contracted form of Sint Nicolaas) is a major celebration in both the Netherlands and Flanders. Among Orthodox Christians, the historical Nicholas of Myra is honored and revered as a Saint. Saint Nicholas is revered by many as the patron saint of sailors, merchants, archers, children and students throughout the Orthodox world. In truth you were revealed to your flock as a rule of faith, a model of meekness, and a teacher of self-control. Therefore you have won the heights by humility, riches by poverty. Holy Father, Bishop Nicholas, intercede with Christ our God that our souls may be saved. Nicholas of Myra (also Nikolaus) in Lycia, Asia Minor (lived c. 270 – 345/352), was a 4th century bishop and is a Christian saint. His feast day is December 6, presumably the date of his death. In the Netherlands 5 December is known as his feast: this is Sinterklaasavond, or St Nicholas’ Eve. Among Christians, he is also known as the “Miracle Worker”. Several acts of kindness and miracles are attributed to him. Historical accounts often confuse him with the later Nicholas of Sion. Nicholas was born in Asia Minor during the 3rd century at Patara in the province of Lycia, at a time when the region was Hellenistic in its culture and outlook. Nicholas became bishop of the city of Myra. He was very religious from an early age and devoted his life entirely to Christianity. He is said to have been born to relatively affluent Christian parents in Patara, Lycia, Asia Minor, Roman Empire where he also received his early schooling. According to some sources, his parents died while he was still a child, leaving a paternal uncle to care for him. Other sources place the death of his parents at the time he was already a young adult, leading him to a period of soul-searching which finally resulted in his uncle introducing him to Christianity. Whatever the reason, as a young adult and scholar, Nicholas moved to Myra to continue his studies and there the above-mentioned uncle introduced him to the local bishop. The latter is said to have seen potential in the youth and took Nicholas under his patronage. Nicholas received his ordination as a priest at an early age. Nicholas’ early activities as a priest are said to have occurred during the reign of co-ruling Roman Emperors Diocletian (reigned 284 – 305) and Maximian (reigned 286 – 305) from which comes the estimation of his age. Diocletian issued an edict in 303 authorizing the systematic persecution of Christians across the Empire. Following the abdication of the two Emperors on May 1, 305 the policies of their successors towards Christians were different. In the Western part of the Empire Constantius Chlorus (reigned 305 – 306) put an end to the systematic persecution upon his accession to the throne. In the Eastern part Galerius (reigned 305 – 311) continued the persecution until 311 when he issued a general edict of toleration from his deathbed. The persecution of 303 – 311 is considered to be the longest in the history of the Empire. Nicholas survived this period although his activities at the time are uncertain. Following Galerius’ death his surviving co-ruler Licinius (reigned 307 – 324) mostly tolerated Christians. As a result their community was allowed to further develop, and the various bishops who acted as their leaders managed to concentrate religious, social and political influence as well as wealth in their hands. In many cases they acted as the heads of their respective cities. It is apparently in this period that Nicholas rose to become bishop of Myra. Judging from tradition, he was probably well loved and respected in his area, mostly as a result of his charitable activities. As with other bishops of the time, Nicholas’ popularity would serve to ensure his position and influence during and after this period. The destruction of several pagan temples is also attributed to him, among them one temple of Artemis (also known as Diana). Because the celebration of Diana’s birth is on December 6, some authors have speculated that this date was deliberately chosen for Nicholas’ feast day to overshadow or replace the pagan celebrations. Nicholas is also known for coming to the defense of the falsely accused, often preventing them from being executed, and for his prayers on behalf of sailors and other travelers. The popular veneration of Nicholas as a saint seems to have started relatively early. Justinian I, Emperor of the Eastern Roman Empire (reigned 527 – 565) is reported to have built a temple (i.e. a church building) in Nicholas’s honor in Constantinople, the Roman capital of the time. In 324 Licinius was defeated in a war against his Western co-ruler Constantine I of the Roman Empire (reigned 306 – 337). The end of the war found the Roman Empire unified under the rule of Constantine. Instead of tolerance, his policies towards Christians consisted of active support. Under his patronage the Christian church experienced an age of prosperity. But the relative peace of his reign brought to the forefront the internal conflict within contemporary Christianity. One of the apparent main reasons of this conflict was the failure to agree to a commonly accepted concept about God in general and Jesus in particular. At this time the teachings of Arius in Alexandria, Egypt were gaining popular support but also attracting great opposition. They would form the basis of Arianism. Emerging fanaticism in both opposing factions only resulted in spreading tumult across the Empire. A later writer claimed that after Arius had presented his case against Jesus’ divinity to the Council, Nicholas hit Arius in the face out of indignation. Nicholas was kicked out of the Council for this offence, and jailed as well. However, according to this account, that night the Virgin Mary appeared in a vision to many of the bishops of the Council, telling them to forgive Nicholas, for he had done it out of love for her Son. They released Nicholas and allowed him back into the process the next day. Following this apparent victory to his faction Nicholas returned to Myra. He is applauded by later Christian writers for keeping Myra free of Arianism. But the decisions of the council failed to stop the spread of Arianism. In fact the tides soon turned and in his later years Arianism managed to win favour with Constantine. In fact Constantine was baptised by Eusebius of Nicomedia, an Arian bishop who had also attended the council, shortly before his death on May 22, 337. Constantine was succeeded by his three surviving sons: Constantine II of the Roman Empire (reigned 337 – 340), Constantius II (reigned 337 – 361) and Constans (reigned 337 – 350). Constantius originally received the Eastern part of the Empire but the death of his brothers left the entire Empire under his control. During his reign he strongly favored Arianism by seeking to place Arian bishops in most positions. There is no indication that Nicholas was affected by these policies and he remained in his position till his death. This lack of disturbance by the Arian Emperor has been seen as indicating the strong support Nicholas had gained among the people of his territory. According to this reasoning not even Constantius would risk a possible revolt by removing a popular bishop. On August 26, 1071 Romanus IV, Emperor of the Eastern Roman Empire (reigned 1068 – 1071) faced Sultan Alp Arslan of the Seljuk Turks (reigned 1059 – 1072) in the Battle of Manzikert. The battle ended in humiliating defeat and capture for Romanus. As a result the Empire temporarily lost control over most of Asia Minor to the invading Seljuk Turks. It would regain its control over Asia Minor during the reign of Alexius I Comnenus, (reigned 1081 – 1118). But early in his reign Myra was overtaken by the Islamic invaders. Taking advantage of the confusion sailors from Bari, Italy seized the remains of the saint over the objections of the Orthodox monks then caring for them. Returning to Bari they brought the remains with them. The remains arrived on May 9, 1087. Some observers have reported seeing myrrh exude from these relics. In the summer of 2005, the report of this measurements was sent to a forensic laboratory in England. The review of the data revealed that the historical Saint Nicholas was barely five foot in height (while not exactly small, still shorter than average, even for his time) and had a broken nose. This last may seem strange for a man of “saintly behavior”, but would fit perfectly with Nicholas’ sometimes violent nature as reported at the First Ecumenical Council. Saint Nicholas is the patron saint of sailors and is often called upon by sailors who are in danger of drowning or being shipwrecked. According to one legend, as a young man Nicholas went to study in Alexandria and on one of his (sea) voyages from Myra to Alexandria he is said to have saved the life of a sailor who fell from the ship’s rigging in a storm. In a colorful version of this legend, Nicholas saved the man on his voyage back from Alexandria to Myra and upon his arrival took the sailor to the church. At that time the old bishop had just died and the church fathers were instructed in a dream to choose for their next bishop a “man of victory” (Greek: Nikei). While the saint was praying, the loose-lipped sailor went around telling how courageously he was saved by the man Nikei-laos, upon which the church elders had no choice but to appoint Nicholas as their new bishop. Another legend tells how a terrible famine struck the island and a malicious butcher lured three little children into his house, only to kill and slaughter them and put their remains in a barrel to cure, planning to sell them off as ham. Saint Nicholas, visiting the region to care for the hungry, not only saw through the butcher’s horrific crime but also managed to resurrect the three boys from the barrel. In his most famous exploit however, a poor man had three daughters but could not affort a proper dowry for them. This meant that they would remain unmarried and probably, in absence of any other possible employment would have to become prostitutes. Hearing of the poor man’s plight, Nicholas decided to help him but being too modest (or too shy) to help the man in public, he went to his house under the cover of night and threw three purses filled with gold coins through the window opening onto the man’s floor. One version has him throwing one purse for three consecutive nights. Another has him throw the purses over a period of three years, each time the night before one of the daughters comes “of age”. Invariably the third time the father lies in waiting, trying to discover their benefactor. In one version the father confronts the saint, only to have Saint Nicholas say it is not him he should thank God alone. In another version, Nicholas learns of the poor man’s plan and drops the third bag down the chimney instead. 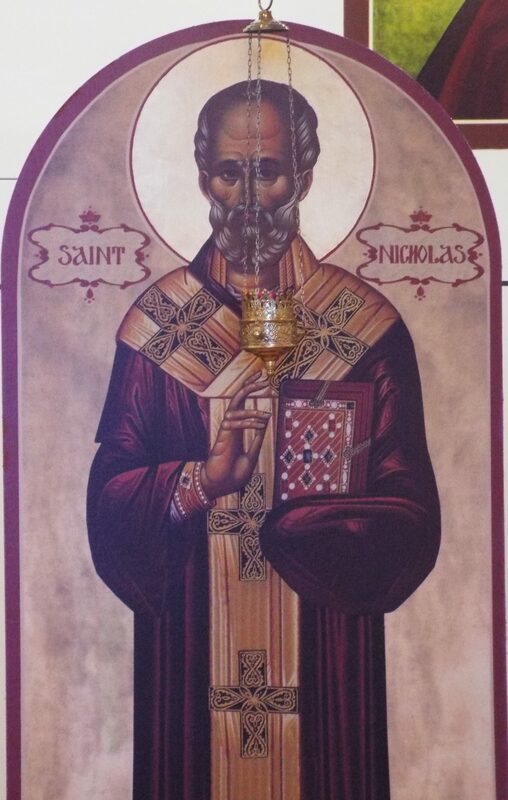 For his help to the poor, Nicholas is the patron saint of pawnbrokers; the three gold balls traditionally hung outside a pawnshop symbolize the three sacks of gold. People then began to suspect that he was behind a large number of other anonymous gifts to the poor, using the inheritance from his wealthy parents. After he died, people in the region continued to give to the poor anonymously, and such gifts were still often attributed to St Nicholas. It should be noted perhaps that a nearly identical story is attributed by Greek folklore to Basil of Caesarea. Basil’s feast day on January 1 is also considered a time of exchanging gifts. It is said that in Myra the bones of Saint Nicholas each year sweated out a clear watery liquid, called Manna, which of course was said to possess immense powers. As the bones were stolen and brought to Bari, they continued to do so, much to the joy of the new owners. So even up to today, a flask of manna is extracted from the tomb of Saint Nicholas every year on December 6th (the Saint’s birthday). It is however worth noting that the tomb lies at sea level in a harbor town so the occurrence of watery liquid can be explained by several theories. Still, neither the church nor any scientists have ever tried to analyse the fluid, so truth still lies in the eye of the believer. One of the most amazing feats of Saint Nicholas however was that he lived to a ripe old age and died peacefully in his own bed. At a time where most saints earned their place in heaven by dying for their faith in manners most unusual and cruel, this definitely made him stand out (together with Saint Martin, who also died of natural old age) and definitely aided to his ‘popularity’ in every way of the word. Among the Greeks and Italians he is a favorite of sailors, fishermen, ships and sailing. As such he has become over time the patron saint of several cities maintaining harbors. In centuries of Greek folklore, Nicholas was seen as “The Lord of the Sea”, often described by modern Greek scholars as a kind of Christianised version of Poseidon. In modern Greece, he is still easily among the most recognisable saints and December 6 finds many cities celebrating their patron saint. He is also the patron saint of all of Greece. In the Middle Ages, both Saint Nicholas and Martin of Tours were celebrated as true people’s saints. Many churches were named for them and later gave their names to the villages that emerged around them. As described above, while most contemporary saints earned their place in heaven by dying for their faith in manners most unusual and cruel, both Nicholas and Martin lived peacefully to a ripe old age. At a time of Religious wars and Crusades the idea that one could go to heaven, even become a saint, just by the way one lived instead of the way one died must have offered a great deal of consolation for the Medieval common folk. Therefore this time made Saint Nicholas a ‘popular’ saint in every sense of the word, more than all his miracles combined. Today, saint Nicholas is still celebrated as a great gift-giver in several Western European countries. According to one source, Medieval nuns used the night of December 6th to anonymously deposit baskets of food and clothes at the doorsteps of the needy. According to another source, On December 6th every sailor or ex-sailor of the Low Countries (which at that time was virtually all of the male population) would descend to the harbour towns to participate in a church celebration for their patron saint. On the way back they would stop at one of the various Nicholas fairs to buy some hard-to-come-by goods, gifts for their loved ones and invariably some little presents for their children. While the real gifts would only be presented at Christmas, the little presents for the children were given right away, courtesy of Saint Nicholas … or Santa Claus… This, and also his miracle of him resurrecting the three butchered children, made Saint Nicholas a patron saint of children and later students as well. The holy person of St Nicholas is a popular subject and is portrayed in countless Orthodox Christian icons, particularly in Russia. In [Latin/Roman] Catholic iconography, Saint Nicholas is depicted as a bishop, wearing all the insignia of this profession: a red bishop’s cloak, a red miter and a bishop’s staff (crozier). Due to the episode with the three dowries, he is shown holding in his hand either three purses, three coins or three golden balls. Depending on whether he is depicted as patron saint of children or sailors, his images will be completed by a background showing ships, children or three figures climbing out of a wooden barrel (the three slaughtered children he resurrected). In a strange twist, the three golden balls referring to the dowry affair are sometimes misinterpreted as being oranges or other fruits. As in the Low Countries, oranges are generally believed to come from Spain, this led to the belief that the Saint lives in Spain and comes to visit every winter bringing oranges and other ‘wintery’ fruits.